Park City, UT (December 13, 2017): Brian Kershisnik’s contemporary figurative paintings are autobiographical narratives, illustrating poignant human emotions derived from personal experiences. Instead of painting from life, Kershisnik paints from the “process of being alive,” resulting in disguised self-portraits that reflect feelings of comfort, delight, puzzlement, union or loneliness as well as more abstract human emotions. Kershisnik considers his artistic process a performance and his canvas the stage, which he portrays literally and metaphorically in his latest body of work for “Le Péché du Magicien,” the Utah artist’s twelfth annual solo show at Meyer Gallery this February. In a literal sense, Kershisnik’s theater theme is not entirely new. 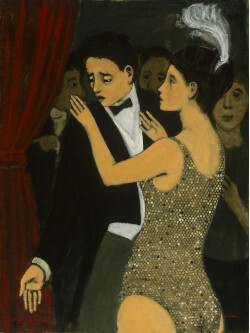 “One of the first paintings I remember doing was a stage,” he recalls. Painted as a young art student, Kershisnik’s first stage predated his artistic identity; devoid of figures or an intentional narrative, the empty stage was a simple exploration of compositional elements. Now, nearly thirty years later, the subject resurfaces in Kershisnik’s paintings as a platform for deeper analysis of the human condition. Magicians, jugglers and dancers embody the exhibition’s motif while also symbolizing abstract concepts relating to warring human emotions. “The Sin of the Magician” and “Protected by Performance” are two of these underlying themes that are explored through multiple paintings in the show. Brian Kershisnik lives in Provo, Utah. He received his BFA in painting at Brigham Young University and his MFA in printmaking at the University of Texas at Austin. He is well traveled having visited and livee in many countries around the world, providing him with a broad perspective of human nature. Meyer Gallery, owned by Susan Meyer, was established in 1965 by Darrell and Gerry Meyer. Since it’s foundation as one of Park City’s premier art galleries, Meyer Gallery has grown to become one of Utah’s leading contemporary art icons. Located at 305 Main Street in an 1890 Historic Landmark Building, the gallery is committed to showcasing Utah’s exciting emerging talent as well as mid-career to established artists from across the region. Gallery artists work in a variety of mediums and styles, from contemporary realism to abstraction.